Finding the perfect cookie recipe for what you love in a cookie is a bit of a personal journey. Figuring out what you want, and how to make that happen. 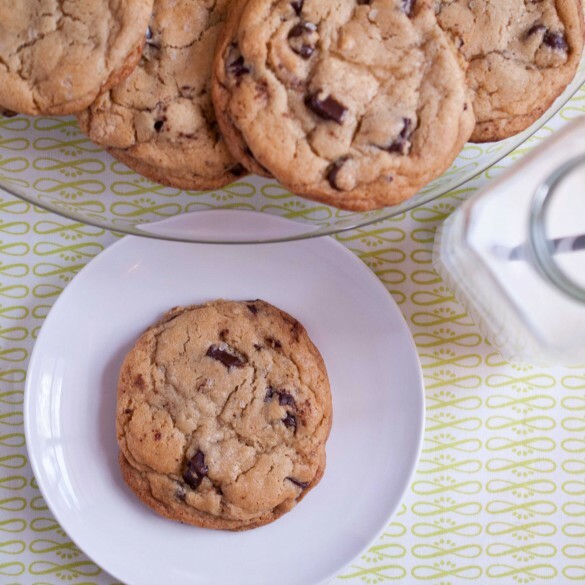 For me, I love a cookie to be soft, chewy, puffy without being cakey and the perfect amount of chocolate chips. I did my research. Years of baking, problem solving, reading and asking people. Consulting pastry chefs, New York times articles, Grandmas, kids, chocolate companies, and my big Sister. It all finally paid off. This recipe is based on the famous and ground breaking New York Times 36 hour, Jaques Torres recipe with a bunch of additional advice and changes. I like to call them Thursday Night Cookies, because if you want to have them over the weekend, you should probably start making them on Thursday night. The wait is worth it, I promise. If you like the kind of cookies that I like, you will love these. In a large bowl, combine both types of flour, baking soda, baking powder, corn starch and 1 tsp salt. All types of flour have different properties and will produce difference results, the combination of these two different types gives you cookies that are both soft and chewy. You won’t get these results if you just use one type or if you use all-purpose flour. In the bowl of a stand mixer, fitted with a paddle attachment, cream the butter with both types of sugar, scraping the bottom of the bowl periodically to ensure the ingredients are well combined. Add the eggs, one at at time, and then the vanilla, beat very well and scraping the inside of the bowl between addition. Reduce speed on the stand mixer to low and add the dry ingredients until just barely combined, making sure to scrape the bottom of the bowl to ensure that the butter and flour are all combined. Add the chocolate chips and stir until incorporated. You don’t want to over mix or your cookies will be tough. This is where you will need some self control. The butter needs to reconstitute as a solid or the cookies won't cook well. Place a sheet of plastic wrap over the bowl and press it against the top of the cookie dough, making a tight seal. Place the cookies in the refrigerator to chill for at least 24 hours, preferably 36 hours. This is important, don’t skip this step or the cookies will spread and become dry and crispy. Once the cookie dough is made, scoop the large golf ball sized cookies onto the cookie sheets, cover and then chill them for at LEAST 4 hours. Not one second shorter. This will only work if the dough is in a ball on the cookie sheet, not if it is still in the bowl. I LOVE a good chocolate chip cookie! These definitely sound like a recipe for success. Wanna send a couple dozen my way? I love, love, love this recipe because the cookies are crisp on the outside and chewy (but not raw!) on the inside. I also like that it takes 24-36 hours to make. Cuts down on the baking fatigue factor. –Use the extra-big morsel dark chocolate chips. –I flatten (not roll) the dough out then cut the cookies into squares before baking. They do this at Specialties Bakery (I know it’s a chain, but their cookies are good.) and they seem to cook more evenly this way. –Use good, natural sea salt for the sprinkle on the top. It makes a difference. –Instead of bread flour, I use something called Peak Performer made by Giusto’s Vita-Grain. It is ground at a fineness between a bread flour and and all purpose flour. It makes excellent bread and pizza (if you don’t use 00 for pizza, that is.) It might be hard to find since it’s made in San Francisco, where I live. But I think it’s the best. Can you believe I haven’t tried these? I’m too big a fan of Cook’s Illustrated chocolate chip cookies to stray. I do need to try them though, these look amazing! I totally get that. I’m pretty loyal to Cooks Illustrated Foolproof pie dough, but I’ve never tried the cookie recipe. This did turn out pretty amazing, I think I finally found a cookie recipe I’ll stick to! I could transfer them pretty soon, maybe a minute. I put them on paper towels because I think it’s easier. I really love a soft chewy cookie, so these were perfect for me! Thank you for this post it is very knowledgable and this recipe. I was skeptical about it too, but once i made it, I will never make another cookie recipe again. I love it. It is the best. These look awesome! I’ve found that letting the dough rest def makes them taste the best! I’ve been meaning to make Jacques Torres’s recipe for a while, but I feel guilty cheating on my regular recipe. They look so good! I would love to know what you think of the Jacques Torres recipe vs yours, you have a great recipe. These 36 hours are just too much for my cooking style, but 4 hours are acceptable, thanks. 🙂 I am sure these cookies are delicious. Try cooking on parchment paper and just sliding the whole sheet off of the cookie tray and onto the counter to cool. One question: Do you completely melt the butter first? Do you melt and then cool? You don’t melt the butter at all. The best recipe is the standard Toll House recipe. The secret is not cook them so long. Really 20+ minutes. I make cookies at least 3 times the size of those pictured and never cook them longer than 12 to 14 minutes. When I make cookies for the office I never bring any home. If you see golden brown in the oven the cookie is burned. I grew up making the Toll House recipe and it is good, but I think the changes Jaques Torres made were significant. Mainly, allowing the cookies to rest and chill give them much more of an expensive bakery taste. Also, I add corn starch to allow them to stay together and not spread out as much during cooking. Also, this isn’t a recipe that needs to be under-baked, like Toll House does, in order to have a gooey, soft center. Once these cookies are a light golden, they are perfect, not burnt. Being that they are chilled, right out of the fridge is the reason they need more than 12-14 minutes like a Toll House batch at room temperature. Using two kinds of flour is the only way to get cookies that are chewy, all purpose flour has too low of a gluten content to allow cookies to be very chewy. The cookies in my picture are pretty large, about 4 inches across. That is why I say that only 6 fit on a standard baking sheet. If yours are 3-4 times larger, they must be the size of a plate. Your cookies are FLAT mine stand tall and spread very little. That is where I get the size difference. The cookies pictured look totally unappetizing I am sorry. I’ll send you pictures someday. Ken, I completely disagree. These cookies look AMAZING and don’t knock it til you try it, these cookies have a fabulous taste and texture. If yours are three times the size of a golf ball before baking and they spread very little, they must be like cupcakes, not cookies. I am looking forward to tryin this recipe! However I live at 7,500ft above sea level. Is there some kind of a change I need to make to either the recipe or cooking time/temp? Toll House recipe the best??? Sorry Ken…not a chance. They’re OK, but nowhere near the best! And there are few things that I would say are best from Cooks Illustrated. CI has good pointers for very basic things (like pie dough), but that’s about it (I own both CI’s ‘Best Recipe’ and CI’s ‘Baker’s Illustrated’). This recipe sounds great, but time consuming. I’ll definitely give them a try, but I have a phenomenal recipe for CC cookies with oatmeal. Honestly, one of my fav cookie recipes ever…they come out with a slight crisp on the outside and are definitely chewy on the inside…and only using AP flour (sorry to disagree, but you can get chewy cookies using only all-purpose flour). Do you use King Arthur AP flour? it has a higher gluten content than store generic store bough so the chewy factor is higher, I should mentioned that not all AP flours are the same. Ken sounds like a moron. Or a seven year old. Not sure which one. If cookies are not light golden in color, they are underbaked. Golden cookies are the sign of carmelized sugar. If you make the toll house recipe and underbake the cookies, you get doughy (not chewy) cookies in which the sugars are uncarmelized. Sorry, Ken, but you can’t get chewy cookies with the toll house recipe, even with your “secret” of underbaking them so they’re anemic and medium rare. Yuck. My cookies just came out of the oven and, wow. They really are the best chocolate chip cookies, ever. Thanks for the recipe! Quick question before I try your recipe… I just received a Kitchen Aid Mixer for Christmas and am starting to convert my baking processes so forgive my naivety. When you suggest scraping the bowl, do you try to sneak down to the bottom while the mixer is on or do you stop the mixer and scrape away and restart? Thanks! That’s a fabulous Christmas present! You want to stop the mixer, lift the head up and scrap the bottom. The paddle attachment does a better job that the whisk attachment at getting to the bottom of the bowl, but there is still quite a bit that isn’t touched. If you don’t scrape it down every now and again, you will have a LOT of butter that doesn’t get mixed in and it will change the recipe that you are working with. I am a big believer in waiting for my cookie dough to chill, so I will follow your advice. These cookies are so interesting with the cake flour and corn starch. I actually read the entire recipe through because I am so intrigued. I am always on the hunt for the perfect chocolate chip cookie recipe and it seems like I always have a new favorite. I guess I’ll have to give these a whirl too! Jaques Torres is pretty brilliant! my favorite by far! I am so happy to read this. Have been making toll house for years and I’m not happy with them. Will try this one, sounds perfect. YAAAYY!! So glad 🙂 They really are worth all the trouble! Made them last night. They are really good and they look professional! These cookies look amazing and like they are definitely worth the time! I think the anticipation of the cookies and the weekend might make the end of the week go faster. It seems backward, but that’s just how my brain works. I am so excited to try these cookies! I made the dough last night and they are in the refrig but I noticed as I re-read the recipe that I forgot and put three stick of butter in, not 2 1/2. Jackie, did I totally mess up or will they be edible? Better too much than not enough! They might be a little grease, but should be fine (I hope). Let me know how it goes! Just wanted to let you know that I made these today and so delicious! Thank you so much for the recipe. Jackie-you’ve got it girl. 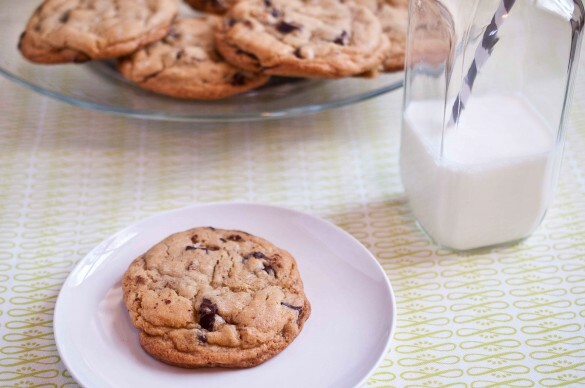 The Best Chocolate Chip Cookie recipe. These were soooo good and just how I like them, chewy, chocolatey and just perfect. Cooking for 21 minutes though made mine burn. :(. I went with just 11 in my oven. Maybe I did something wrong? Anyway, I’ve posted on my blog which I hope is ok with a link back. Thank you for this divine recipe! Oh no! Did you use the 36 hour method or the 4 hour method? Strange, cookies at room temp usually take 10-12 minutes, ice cold ones should take a lot longer. Not sure what happened but I’m glad you figured it out! I’ve made the cookies several times now as people love them! I also cook mine for 13-15 minutes straight out of the fridge; just when they start to get a little golden I take them out and they are great! Thank you for the recipe! I was so excited to make these! But then I realized I don’t have cake or bread flour!! 🙁 I am guessing regular flour won’t work as well?? It will have to wait till the next grocery shopping trip! Looking forward to making them though! All purpose flour just doesn’t have the gluten/protein content to make them chewy. You should wait until you have both kinds to make it worth all of the trouble. Yes! That’s what I did! I am just about to put the first batch in the oven. I even was able to wait 36 hours… 🙂 My only problem is I don’t have parchment paper 🙁 So I am hoping that won’t ruin them. These are the best cookies, well worth the wait!! Oh wow, what a stunning picture! The recipe is equally mouth-watering. Shall try this recipe: saving this for the weekend!! Hi Jackie, I made these a few days ago and followed the recipe exactly as you wrote it, but my cookies came out a bit more cake-like than yours look. They taste great, but the texture was more fluffy than the average cookie. I have a gas oven. Could that be it? Probably not. The only thing I can think of, is that when cookie dough is over-worked it can become cakey. Or maybe the brand of baking powder/soda was super highly active, over-leavening the cookies. Just made these. Literally the best cookies I’ve ever had. “Best Chocolate Chip Cookie Recipe Ever” was not an exaggeration. Have you ever tried to freeze cookie dough? I think I’m going to try. I’m going to make them into balls like I would bake, but then freeze them on cookie sheets in the freezer for a couple of hours. Then once they are hard enough to not stick together, put them in baggies. The only thing I’m not sure about is when I’m ready to bake a few, if I should let them thaw some or just add baking time. What do you think?